Reading striker Nicholas Bignall has signed for Bournemouth on a one-month loan deal. 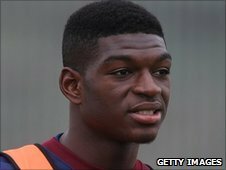 The 20-year-old is a product of the Royals' academy and has had loans at Cheltenham, Stockport and Northampton. Bignall, who can play centrally or on the wing, also had a loan spell at Southampton in October, making four appearances for the Saints. The striker signed a new Reading contract last month to keep him at the club until the summer of 2012.